A hate crime took place in Tel Aviv last night. Someone went on a shooting rampage in a meeting of gay youth. Two are dead, 11 wounded, some seriously. The murderer has escaped. 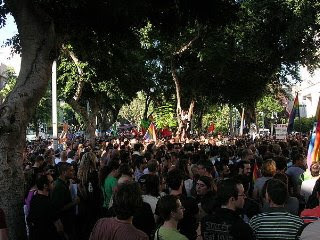 This afternoon queers took to the streets in Tel Aviv, Jerusalem, Haifa and Beersheva. Many Parliament members and public representatives spoke in these sad gatherings. One Parliament member, Shelly Yechimovits, said that some of the boys and girls wounded, lie alone in hospital. Their families, shocked more by the discovery that they are gay then by the fact they have been the target of a terror attack, will not come and sit at their bedside.